Over 130 attended a Patient-Centered Outcomes Research Institute webinar on July 19 featuring Drs. Giana Davidson and Nathan Shapiro discussing stakeholder engagement in the CODA study. The webinar highlighted ways to find and initiate partnerships for patient-centered research. Drs. Davidson and Shapiro shared strategies, explained how they formed partnerships, and shared challenges and lessons learned from CODA. View the archived webinar and follow-up blog post. 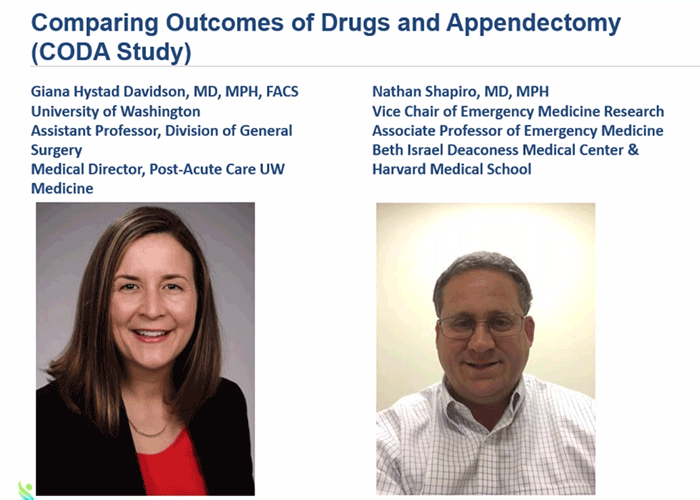 The East Journal Club recently held a Twitter chat on surgery vs. antibiotics for appendicitis, including the CODA study. View the recap and follow the CERTAIN learning healthcare system on Twitter at @certainWA.